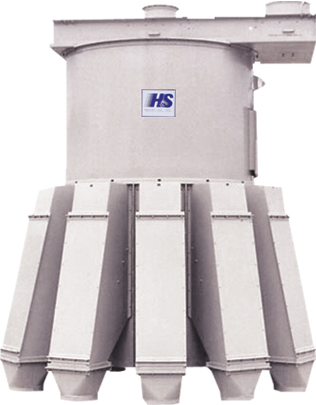 The Hayes & Stolz Model EK Dual Inlet Distributor has two separately controlled internal rotating spouts to allow simultaneous loading from two separate sources. The Model EK is equipped with two independent electric gearmotors that power the internal spouts as they rotate to the desired outlet position. The standard sizes for Model EK Distributors range from 6″ to 48″ diameter inlets/outlets and are available with three (3) to thirty (30) outlets. The angle of the internal spout for flowability is standard at 45°, 50° or 55°. See Features/Options tab for available options for Hayes & Stolz Model EK Distributors.